Do you have a creative kid? Let me tell you. I have 3. Yes, my 8, 5 and 2 year old are all creatives. They love crafting, recycling and sewing. My 2 oldest learned to sew this summer and each made their own pajama pants. My daughter can't walk by the recycle bin without pulling something out to make a project with. Sometimes it can be hard to figure out gifts for creative kids. This Christmas I really wanted to give them some gifts they could use to be "makers". Last year my sister got my son this Create Your Own Little Monsters Kit. He had such a fun time making his monsters that I wanted to find some other great projects for the kids to do. Not only was the project fun, but it was great for both his small motor skills and for his problem solving. I want more gifts that are like this for my kids. That's why this year I put together this list of gifts for creative kids. Perhaps you have the same wishes for your kids. You want gifts they can enjoy, create and learn from. I've been researching, compiling and not I'm sharing. I hope you'll get some inspiration and have fun putting together your own gifts for your creative child. My little ones love to help sew but they can make their own quilts with this DIY quilt kit. Put together a quick clay snowman kit with this tutorial and let them build their own. Make a pillowcase kit for that creative kid to sew up their own personalized pillowcase. Print the directions and include the fabric in a fun bag or package. 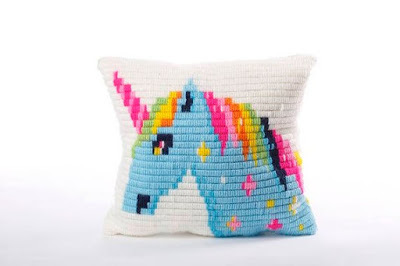 This super fun Unicorn Pillow Kit that is perfect for the beginner embroiderer. Making snowglobes is loads of fun but make your own with this Water Globe Kit. Creative kids love making forts. Make your own DIY Play Kit to create a fun play area. Did you know you can make your own bouncy balls? Yep. You can and they can glow in the dark too!! Put together a nature adventure kit and go exploring. Get them ready for rainy and snowy weather with these Rainy Day Tokens. Have a little baker? Put together a quick Bakers Kit with this tutorial and our free Kids Apron Pattern. Have a little one that loves rock painting? Give them a DIY Rock Painting basket with supplies. Start with some plain felt colors and a needle and embroidery floss. Then print instructions for making a felt pony, or felt mermaid or felt mittens. Who doesn't love to a personalized gift. What about crayons that spell your name. 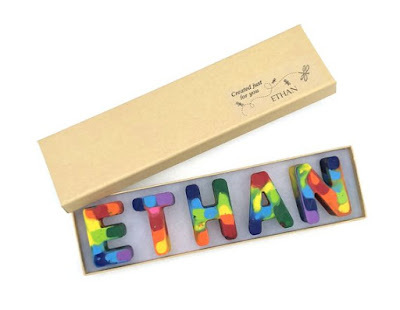 These personalized crayons are such a fun gift idea. Stitch up a quick pencil pouch and fill it with Spirographs. Kids love stencils but they'll love these stencils they can use with Rainbow Scratch Art paper. Stickers are great, but stickers you can color are even better. Have a world traveler? Help your creative kid learn the countries of the world with this Doodle World Map. Felt balls. Everyone needs colorful felt balls. If you want a trendy gift, that creative kid will love Glow in the Dark Slime. No Sew Rainbow Fleece Scarf would make a fun gift kit to give. Buy friendship bracelet supplies and teach them how to make friendship bracelets. Make a little creative kid some superhero capes. Include iron-on decals they can choose from and place on their themselves. Creative kids love to color, but why not let them color their own leggings!! Make them a custom shirt with their favorite logo or personalize it with their name. Keep them clean with this simple Art Smock pattern. They could even sew it up themselves. 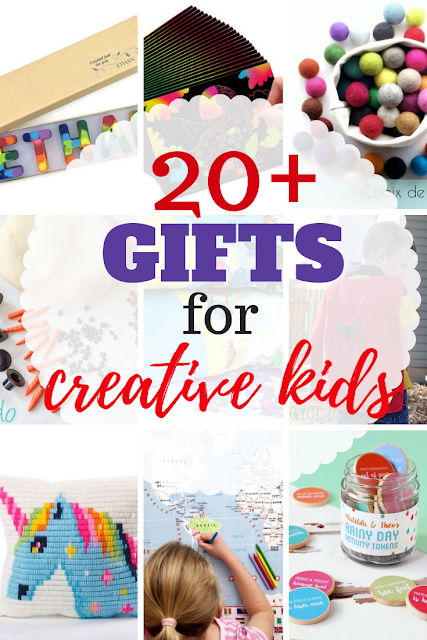 I hope you've gotten some inspiration and ideas from these fun gifts for creative kids. Remember, you don't have to work super hard to find something a creative kid will enjoy. Sometimes, just an old Amazon box from the garage makes a great gift for creative kids.